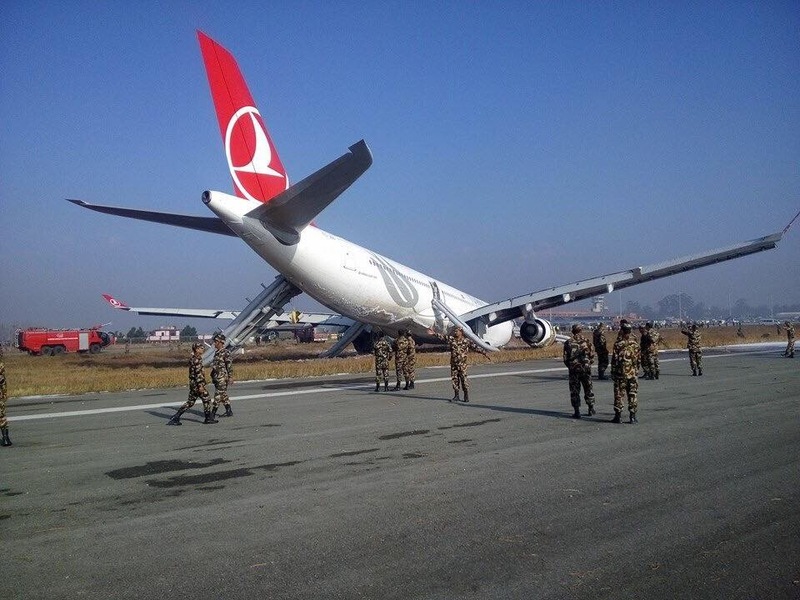 It’s been quite a week here in Kathmandu: the crash-landing on March 4th of a Turkish Airlines plane in Nepal’s only international airport closed it for four days. That meant about 80,000 people were stranded trying to get in or out of Nepal. “We start digging the well when we see the fire” says a Nepali friend describing the level of preparedness for dealing with an airplane crash on the runway. Or as my husband, John, who was stranded in Bangkok, likes to tell our three boys: “You’re on your own, bud.” Hardest hit were the tens of thousands of Nepali migrants workers who not only had to bunk down on airport floors but who worried about losing, before they even started, the menial jobs for which they had mortgaged themselves for years to loan sharks. 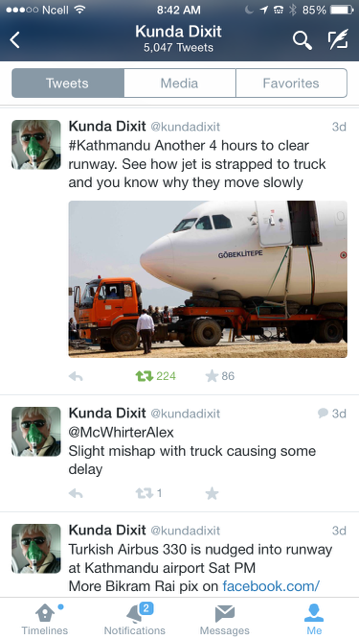 There was no government communication system in place to keep passengers informed but there some very dedicated Nepali journalists on Twitter. It was possible to follow the drama 24/7 in 140 characters or less. The disabled plane blocked the airport’s only runway, and every failed attempt to move it (there were many), every inch of molasses-slow towing, was documented in detail. The Nepali Times rechristened Tribhuvan International Airport as Tribhuvan Intermittent Airport. 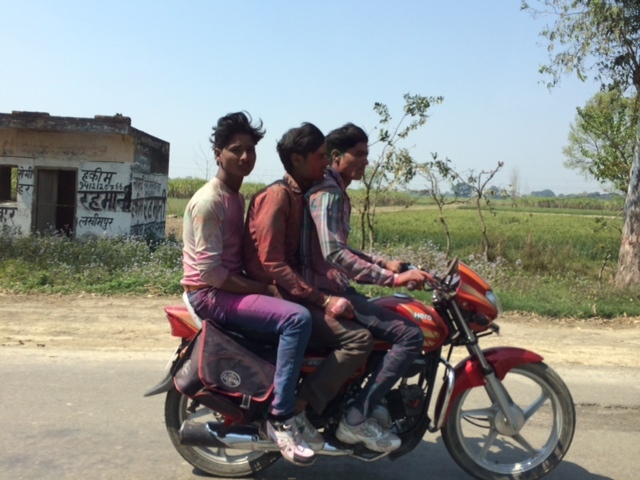 It was the major Hindu festival of Holi, so immigration staff in Nepalganj was skeletal on both sides. Getting an exit stamp on the Indian side was relatively easy, but on the Nepal side, the woman sitting in the immigration office insisted that she was not authorized to stamp John’s passport. Knowing that a future exit would require it, John refused to leave and the woman relented after telephoning someone in authority and, with John’s assistance, finding the appropriate stamp in a desk drawer. When the airport opened at 7:30 p.m. on March 7th, the Nepali government announced it would remain open 24 hours a days to move stranded passengers. Airlines doubled and tripled their number of regular flights and by the next afternoon, the scene on both the ground and in the air was once again one of monumental chaos. TIA, a small airport with only one runway and nine parking bays, was trying to land 80 international flights a day (and many domestic ones). Circling in the sky jam for a landing slot in Kathmandu. FlightRadar24, which records live air traffic around the world, showed a massive sky-jam over Chitwan National Park, with as many as seven planes at a time circling for over an hour waiting to land. On the ground it wasn’t much better. Airplanes there sat on taxiways for another hour or more waiting to unload their passengers. Visa lines and baggage claim were a sea of packed human sardines. This is the beginning of the peak tourist trekking and mountain-climbing season in an industry hard hit by October 2014’s Annapurna snow avalanches and April 2014’s tragic icefall on Everest. In the midst of all this chaos, Shah Rukh Khan (@iamsrk), a Bollywood star who is also a Nerolac Paints Nepal brand ambassador, was coming to Kathmandu to launch the company’s “green initiative”, aimed in part at encouraging people to convert their used Nerolac paint cans into flower pots. It’s hard to believe that on March 9th, his Falcon executive jet didn’t get priority landing. Regardless, someone at TIA decided that the best time to close the airport (again), so as to move the Turkish Airlines plane, was around the time this Bollywood personality landed. It was also the busiest time in the sky. Three incoming flights were rerouted to other cities when their “holding fuel” ran out and others circled endlessly in the skies over Chitwan. 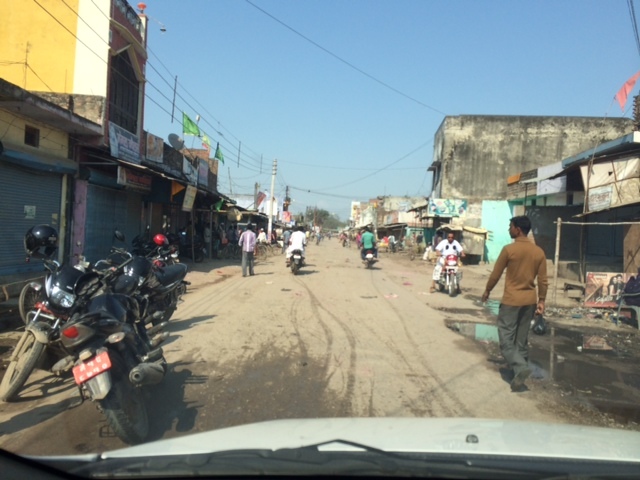 In the Nepali border town of Raxaul, some worried that the unrecognized dense air traffic were UFOs. As for John – he will soon have to leave again, hopefully by plane and on a non-delayed, non-stop flight. This entry was posted in airplanes, Kathmandu, Nepal and tagged Kathmandu, Nepal, Nepali Times, tribhuvan international airport, turkish airlines on March 11, 2015 by Donatella Lorch. There is an intimacy to landing in Kathmandu. 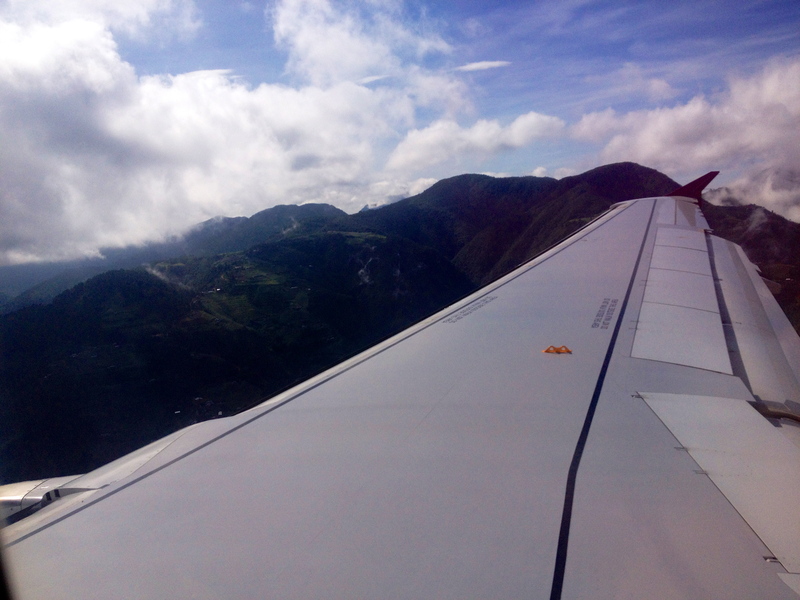 From the plane window, you can see the wings skim the mountains as the hairpin dirt roads leading to perched villages close in above you. From my neighborhood, earth and sky rumble together with each approaching plane. When I was 27, fresh from two years of reporting inside Afghanistan, the New York Times assigned me to cover the borough of Queens. To soothe my homesickness for the wind-swept arid mountain ranges I had left behind, every morning I slowed down as I drove past La Guardia airport, rolled down my window, and deeply inhaled the jet fuel. Then planes were about escape. In Kathmandu, 25 years later, it means connection. I live near the main landing path, and the sound of a plane is both comforting and awe-inspiring. It means that neither the valley’s fog, smog, storms nor its unpredictable wind shear have closed Kathmandu’s airspace. Kathmandu is a pilot-only, visual-only landing, and every time I fly in or out, or listen to a plane overhead, I am reminded that technology is not solely in control but that just one person is leading the way in. Economists refer to it as ‘connectivity’. A poor country cannot reach middle-income status unless its people can be connected by economic, social and political opportunities within their country and with other economies. This cannot be done without roads and airports. The challenge is huge in Nepal, South Asia’s poorest nation, a vertical land where roads have to be carved out of steep, unstable cliffs that are prone to landslides and where mountains rise so fast and sheer that radar is not always relevant and planes have very limited options on how to get to an airstrip. Imagine terrain so perpendicular that pilots turn off their ground proximity warning system because the constant computer generated voice warning: “Terrain, terrain, terrain,” is not only obvious but also distracting. Nepal has 48 airports, mostly dirt strips precariously balanced on mountain tops or in narrow valleys, but there is only one international runway, Tribhuvan International Airport, an example of the vast complexities surrounding the issue of connectivity that go beyond just being able to land planes. 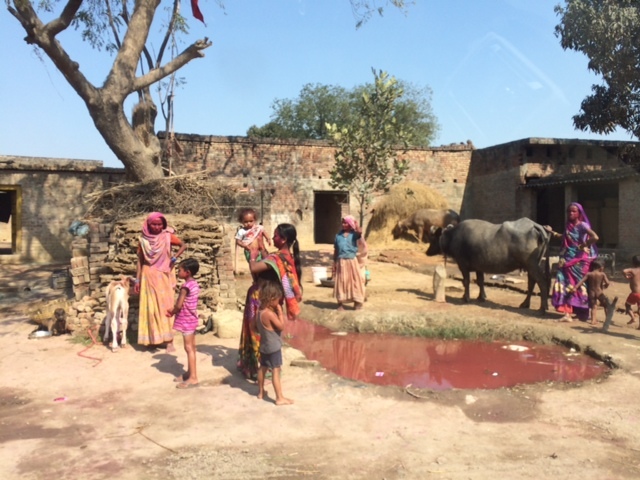 In Nepal, tourism is the second biggest earner of foreign exchange, and with mostly dirt roads and vast numbers of road casualties, planes are critical to enabling tourists to come and continue to fuel growth. Yet what happens when tourists come faster than the existing infrastructure can accommodate? Set inside the city of Kathmandu, TIA is bursting at the seams. It has only nine bays, but almost 50 daily international arrivals and more than twice that number for national flights. Visas are available on arrival, but the line is long and the unbridled crowded chaos of baggage claim is only enhanced by an enveloping dark penumbra. Mandarin seems to be the most spoken tongue. According to the local papers, vast amounts of cash are also exchanging hands at customs, where several officials, including the acting director, are under investigation. Nature is not always cooperative. Flights can stack up for hours circling outside the Kathmandu valley, over Chitwan National Park, a domino effect often started by winter’s morning fog and aggravated by vehicle and generator-induced smog or summer monsoon storms and wind shears. There is one landing strip in dire need of re-tarmacking. Last summer, earth worms infested the runway, attracting nearby birds and closing down the airport for a day. When I fly in or out, I find myself glued to the FlightRadar24 app, scanning weather and delays. The international airline with most delays appears to be Turkish Air, which has the uncooperative 6:55 a.m. landing slot: thick fog at that time often brings long landing delays and recently a flight was even rerouted to Bangladesh for the day because of it. The radar system, only for international approaches, is 25 years old and was installed after two major airplane crashes caused by white-out conditions, but it is struggling to keep up with the rapidly growing traffic. With only a 30-mile radius and blind spots, it is scheduled for a much needed facelift and expansion. Yet international flights are almost always full, especially the five daily jets coming from five different Chinese cities and the scores of flights from the Middle East and South East Asia—the latter often carrying Nepali migrant workers to and from their host countries. Business must be good as landing rights at TIA are more expensive than Bangkok and on par with Singapore, while refueling charges are extremely high (all fuel comes by truck from India). In addition, pilots need special simulator training for Kathmandu landings. Two airlines, Qatar and Korean Air, are now even using the newest technology, satellite-based GPS systems, that provide the pilots with more information and greater leeway during their landing approach. As in every other sector in Nepal, there are many improvement plans afoot. The government wants to build two new international airports, and is actively pursuing the Chinese government for soft loans. But airports are also competing with projects such as hydropower plants, expressways to India and China, waste water treatment plants, drinking water for the Kathmandu Valley, and sewage systems for all their cities. The wish list is long, the government cash-strapped, and so far investment is only cautiously moving in. TIA will be it for the next few years. That means accommodating the dozens of extra weekly flights scheduled to start soon from China. I don’t see the two security check lines that snake through the length of the departure area getting any shorter. This entry was posted in airplanes, airports, development, donatella lorch, Kathmandu, living overseas, Nepal, tourism and tagged airplanes, airports, aviation, Donatella Lorch, Kathmandu, Kathmandu Valley, mountains, tourism on November 12, 2014 by Donatella Lorch.